Having the perfect pool for your home can take some work. 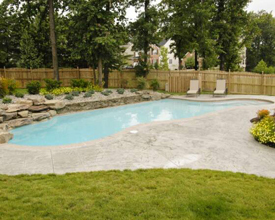 You’ve got so many options when it comes to customizing your new in-ground pool. Do you want in-ground lighting? What kind of liner works best? Should you even use a liner? What shapes are available? Designing your custom pool usually means a lifelong investment, or at least an important one for the duration of the time that you own your home. It’s also a great selling point when you’ve put your house on the market. It increases your home value and can encourage potential homebuyers to take a second look at your home. You want to make sure that you design it well! Shape – Pools come in many different shapes and sizes. The shape that you choose depends almost entirely on aesthetic. Kidney bean shaped pools are fairly popular, as are rectangular pools. You can also do a free design pool and have extra features installed that work well with the specific shape that you choose. At Sunrise, we’ll work with you to come up with the perfect size and shape for the pool in your backyard. Pool lining or type – The type of pool bottom that you want will be inspired by what looks good as well as by what’s most functional for you. Vinyl is long lasting, difficult to penetrate, and wonderful if you have children. Concrete is one of the most commonly used pool bottoms, but can be rough on your feet if you don’t put a lining down over it. Tile is also an option (we offer tile mosaics for a little extra flair). You just have to be careful to avoid slipping! Add water features – Whether you have kids or not, extra water features can be fun. You can choose anything from waterfalls to pool slides to a built in hot tub. As we like to say here, you’re only limited by your imagination. We also specialize in swim up pool bars, which can be great for children and adults alike. Stay hydrated and have fun all summer long! Even if you aren’t interested in an elaborate feature, something unique will make your home pool stand out. At Sunrise Premier Pools, we want to give you the most variety for your money. We’ll work to help you figure out exactly what you want your perfect pool to be. There are many more options than the ones that are discussed here, and we can’t wait to share them all with you! If you need assistance with your Baltimore pool, or are looking to build a custom pool or spa, feel free to call us at 410.349.3852 or visit our website. Be sure to follow us on Facebook, Twitter, and LinkedIn! This entry was posted on Thursday, July 31st, 2014 at 8:47 pm. Both comments and pings are currently closed.